Go home, put the board on the grass in the back yard or on the floor in the living room and let your Surf Dog check it out! You can now start slowing introducing your Surf Dog to this new strange toy by offering treats when they get on it. You can put there water bowl or food bowl on it at dinner time. Always encourage and praise! Be positive! Work on a command, like ‘up’ to get them onto the board. Repeat this command EVERYTIME they get onto the board. Don’t pick them up and put them on the board! The whole idea is to get them to want to get on the surfboard. This is very, very important. If they don’t like the surfboard, they are not going to like surfing! While you’re working on this, try encouraging your surf Dog to stand in the back 1/3 of the board, facing forward. This is the place and position you’ll want them to be when they are in the water, so start getting them familiar with this spot on the board now! Use a command, a treat and lots of enthusiastic praise to reinforce this behavior. 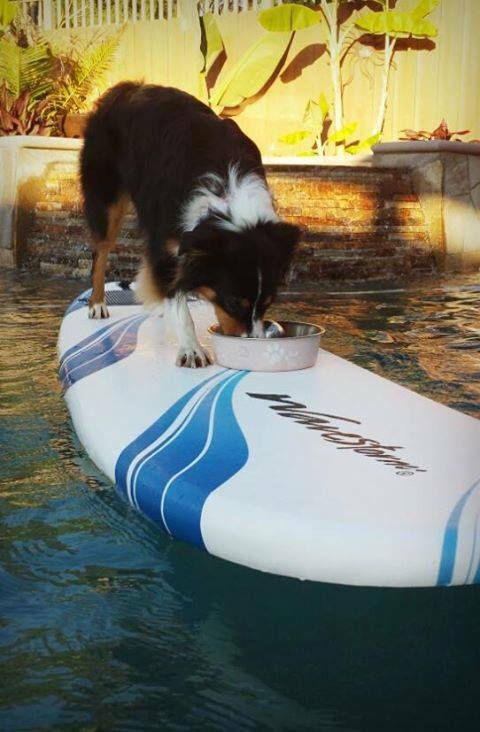 If You’re going to give your surf dog a treat during the day, make them EARN IT by getting on the surfboard first! They will soon understand that this is a good and fun place to be! Not only is she eating on her surfboard but she's doing it in the pool!